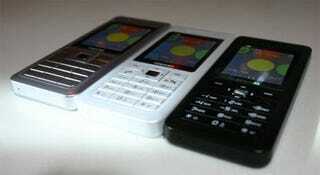 Toshiba's TS30 is a slim candybar phone, targeting a similar audience as Sony Ericsson's K750i. The TS30 has a 1.3 megapixel camera, microSD slot, Bluetooth, and 1.9" screen. The phone's going to be priced around $200 without a plan, so a bit less compared to the k750. Toshiba will ship this in Taiwan and Europe, ready for import to the US if you so wish.